Smoke from car exhaust can be of various types and can be because of a variety of reasons and situations. Ranging from blue, grey, white and blue, every type directly or indirectly is because of a distinct phenomenon. 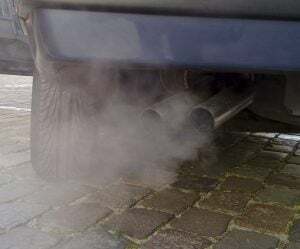 Generally, it is suggested to take your car to mechanic or technician if you experience any smoke from car’s exhaust, but white smoke that we are discussing here could not necessarily be because of any malfunctioning. First of all, it is necessary to access whether the white smoke occurred is, apparently, of very low density, like is it thin or somewhat like vapor and it disappears shortly, or is it of thick density, flowing continuously with some burning type aroma. It is highly suggested to consult mechanic but to make sure he does not fool you with technical terms maneuvering you from the main problem and letting you spend loads in other unnecessary aspects of your car, it is always better to get some knowledge for better understanding of what you are up to. White smoke, as mentioned above, can either be very light just like vapor and secondly, it can be dense as well as heavy smoke. White smoke from the exhaust pipe on startup, idle or acceleration is telling us that there is coolant or water that is getting vaporized. You can taste on the water from the exhaust, if it smells sweet it’s most likely coolant, and in this case, you have a bigger problem. If the smoke emitted is of high density or thick, then you have to get a proper diagnose for your vehicle, because condensed coolants are never good for your engine. Let’s start with the most common causes of white smoke. The most common reason for white smoke from the exhaust pipe that is condensed in the exhaust pipe. White smoke that is like vapor and disappears soon could majorly be because of condensation. Steam is emitted by condensation in exhaust pipe which is seen at exhaust emission. But it is fine and is nothing to worry about as far as your car is maintained. If the white smoke is light and just coming from the startup moment at cold starts, there should be nothing to worry about, because it’s most likely just condense. If your exhaust smoke smells sweet, it’s most likely condensed coolant you are facing with. The most common cause of this on modern vehicles is because of a crack inside the EGR cooler. This can be pretty difficult to diagnose properly as there are no signs you could look for on the outside of the engine. However, if the EGR cooler is cracked, it has to be replaced. 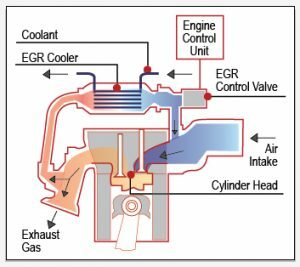 If you suspect that your EGR cooler is faulty, you may have to get help for a mechanic to diagnose it properly. The best way, is to use a Coolant leak tester and taking the EGR pipes off to see if you can see any coolant entering the exhaust pipe. When car’s cylinders head or gasket is either damaged or cracked, not necessarily that crack should be big, coolant starts to leak out of it and get mixes with engine oil. This mixing results in contamination of engine oil are ultimately resulting in white exhaust smoke with some sweet odor smell. If you want to go further into Bad head gasket diagnosing, check out our other article here: Bad Head Gasket Symptoms. The engine will have to get taken apart and be repaired but if not repairable then in worst case it will have to be replace resulting is high costs. Leaking of coolant tank can also be one of the reasons for white smoke. Although it is very rare that coolant’s tank break but it can get damage. Damage could be have been done while repairing some other nearby part and all of the sudden damaging reservoir tank. However, if this happens, the smoke will come from the engine and not from the exhaust pipe. Whatsoever the reason is, it needs to get replaced as there is no other possible option. Replacing it is not a big deal and will not affect the car’s performance after replacement. Another possibility is when oil starts to leak from the piston or if valve seals go faulty. This is resulting in oil leaking into the combustion chamber and getting mixed with fuel that is to be burnt. Burning of this oil and fuel mixture results in blue smoke from exhaust hinting that your engine is prone to more wear and tear as oil is leaking and no proper lubrication is available for engine’s components to work smoothly. Worth mentioning is that when oil is combusted, the oil is rather Blue than white. To fix this problem, usually, the seal will have to be replaced ultimately detaching engine’s main part and then putting its new seals, which will result in high cost as well due to excess labor activity. Purpose of fuel injectors is to provide an engine with sufficient amount of fuel and to make sure that neither more nor less fuel is provided to the engine. In case if these injectors get faulty, the improper supply of fuel led to over burning of fuel resulting in gray, dense smoke from exhaust. A too rich mixture will produce black or gray smoke, but it can easily be mixed with the white smoke. Let a mechanic take a look at the smoke to tell you if it’s coolant, fuel or oil that is getting burned. If the Fuel Injectors is faulty, they have to be replaced, whose price depends on your model and make. There are several ways to diagnose a car with white smoke. However, some ways are easier and faster than others. I work as a mechanic, and this is the way I would diagnose this issue. The first thing you should do is to taste the smoke coming from the exhaust pipe. If it got a sweet smell, it’s coolant, and you can continue with this guide. If the smoke doesn’t smell or taste nothing more than water, it’s most likely condense and the smoke will go away after the car is heated up. The best and only (in my opinion), way to find internal coolant leaks is with a coolant pressure tester. You fit it on your radiator cap and put pressure inside the coolant system and let it stand for an hour. Remove the spark plugs or glow plugs and check for any signs of coolant leaks entering the combustion chamber. If you notice coolant there, you might have a problem with your head gasket or a cracked cylinder head. If you can’t find any coolant there, remove the pipes to the EGR pipes and check for any signs of coolant inside of them. If you notice coolant, there is most likely a crack in the EGR cooler, and you have to replace it. So basically, smoke can be of various types, but white smoke that we have above discussed in detail could be a result of both, fault and general combustion, both. But in fault’s case, it can get repair depending on the nature of fault that will decide too that how much will it cost to repair it and most important of all, is it worth repairing it. If you have any other questions regarding white smoke from the engine or exhaust, comment down below! Fuel Induction Service – What is it & Will it Help?